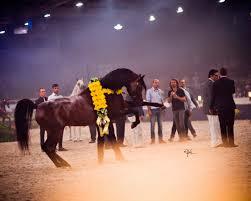 Home Horses The Arabian Breeders' Magazine: Celebrating the Champions - EKS Alihandro. 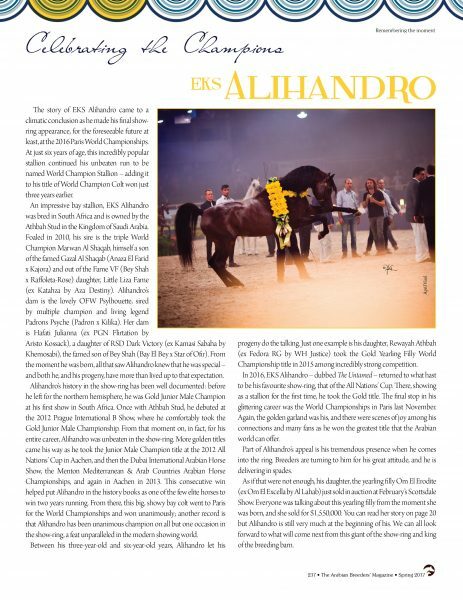 The Arabian Breeders’ Magazine: Celebrating the Champions – EKS Alihandro. Alihandro’s history in the show-ring has been well documented: before he left for the northern hemisphere, he was Gold Junior Male Champion at his first show in South Africa. Once with Athbah Stud, he debuted at the 2012 Prague International B Show, where he comfortably took the Gold Junior Male Championship. From that moment on, in fact, for his entire career, Alihandro was unbeaten in the show-ring. More golden titles came his way as he took the Junior Male Champion title at the 2012 All Nations’ Cup in Aachen, and then the Dubai International Arabian Horse Show, the Menton Mediterranean & Arab Countries Arabian Horse Championships, and again in Aachen in 2013. This consecutive win helped put Alihandro in the history books as one of the few elite horses to win two years running. From there, this big, showy bay colt went to Paris for the World Championships and won unanimously; another record is that Alihandro has been unanimous champion on all but one occasion in the show-ring, a feat unparalleled in the modern showing world. EKS Alihandro. Credit April Vinsel. As if that were not enough, his daughter, the yearling filly Om El Erodite (ex Om El Excella by Al Lahab) just sold in auction at February’s Scottsdale Show. Everyone was talking about this yearling filly from the moment she was born, and she sold for $1,550,000. Alihandro is still very much at the beginning of his story. We can all look forward to what will come next from this giant of the show-ring and king of the breeding barn.